These Salted Egg Yolk Cookies are getting very popular these days especially among the Facebook baking groups. I too became very keen and eager to give it a try and when I saw Zoe’s post of a smaller portion recipe, I just couldn’t wait to jump into the bandwagon to join in the fun. These salted egg yolk cookies are melt-in-your-mouth and very addictive. I like the combination of an in between not so sweet and savoury taste, crumbly texture together with a slight hint of salted egg aroma. Will I bake more? Certainly! These cookies are melt-in-your-mouth and very addictive. 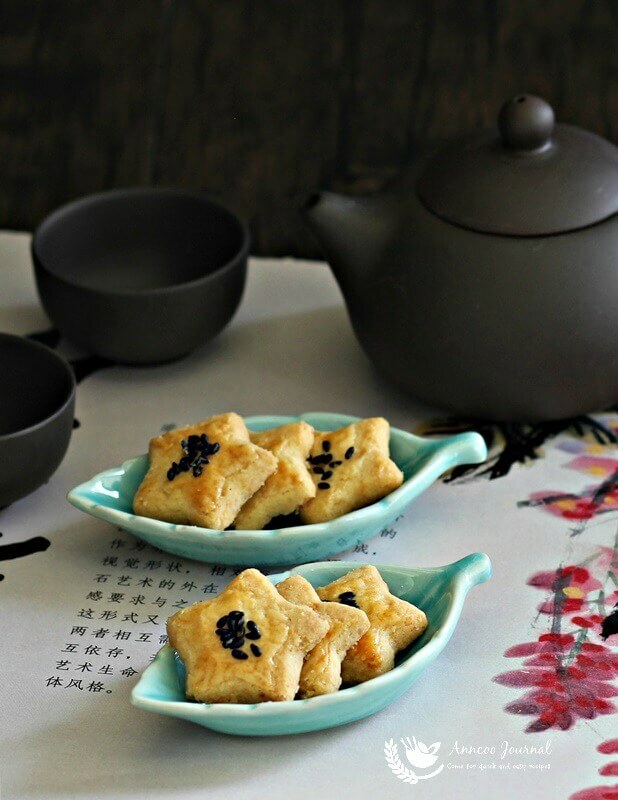 savoury taste, crumbly texture together with a slight hint of salted egg aroma. With an electric mixer, beat butter, sugar and a pinch of salt until light and fluffy. Sift flour, corn flour, baking powder into the butter mixture and fold well with a rubber spatula. Stir in the mashed salted egg yolks and use hand to knead to form to a soft dough (do not over knead). Wrap dough in cling wrap and allow it to rest in fridge for at least 30 minutes. Line baking trays with baking paper and preheat oven to 170 deg C.
Roll dough with some dusted flour into 3mm thickness between 2 plastic sheets and return it to the fridge for 5-10 minutes to harden, before cutting them into shapes using your desired cookie cutter. 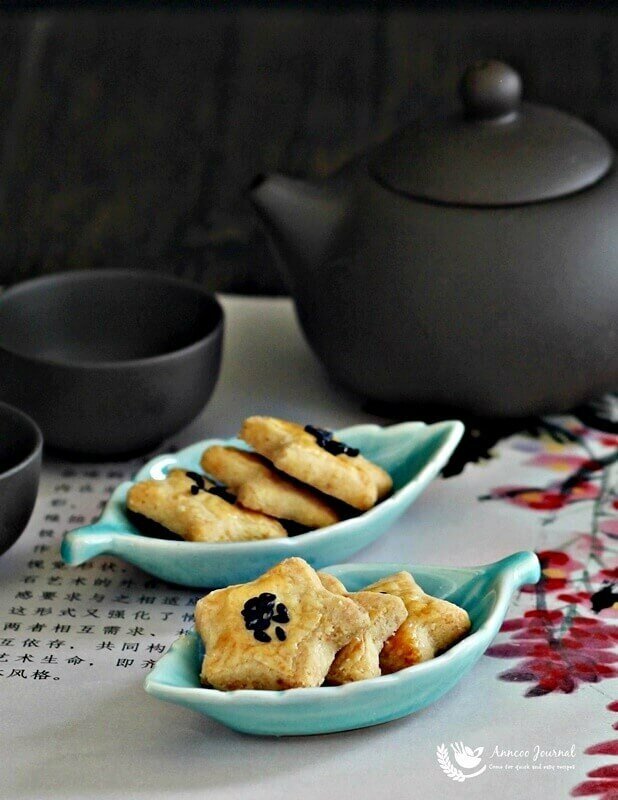 Brush the cookies with egg yolk and sprinkle sesame seeds on them and bake for about 15 minutes or until golden brown. Cool down cookies completely before storing into an airtight container. Hi Ann, thank you for all the recipe you have shared. I have recently bought a packet of salted egg yolk powder. May I know how much powder I should use to replace the fresh salted egg yolk? Many thanks. Hi Caroline, You may use the small amount of egg yolk 25g in the recipe. Salted egg yolk cookies are really popular this year! Gong Xi Fa Cai to u and your family! Sorry for my late visit… Summer school holidays are driving me crazy. You know. Mum, I want this and that… LOL! So cute ! looks so delicious ! 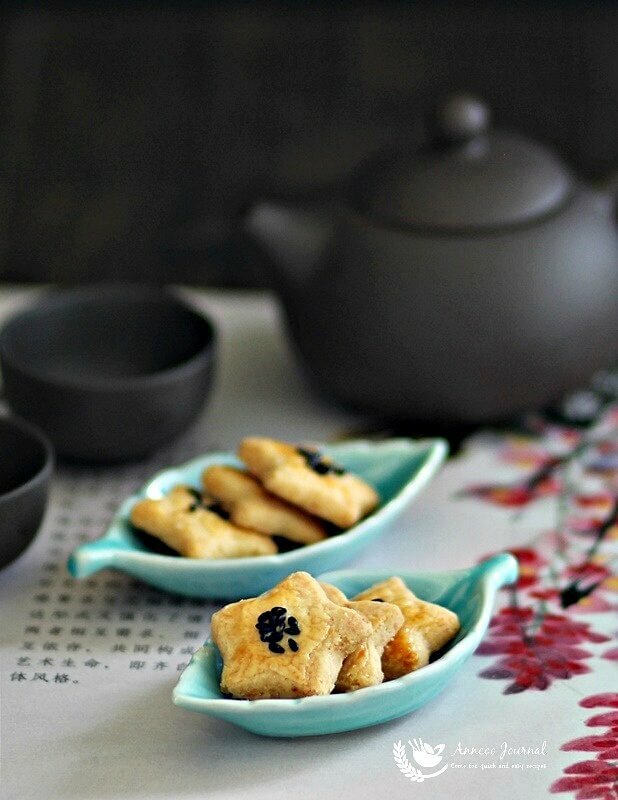 These in between not so sweet and savoury CNY cookies seem creating "a storm". Look so inviting. Yummy! Hi Ann! After reading your post, I went out to buy slated duck eggs. hah..hah… I simply couldn't resist the sight of your salted egg yolk cookies! These cookies look literally melt-in-mouth and so very inviting, Ann.